Careers - Southwark Metal Mfg. Co.
Southwark Metal Manufacturing Co. is a one-of-a-kind workplace. As a third generation family-owned business, we understand that the lion’s share of the value of our company comes from our amazing employees. An overwhelming amount of our staff — from our production floor, to our supervisors, to our customer service associates, to our plant managers — have been with Southwark Metal for a decade or more. We are proud of our employees and their tireless efforts on behalf of Southwark customers. We treat one another with respect, we celebrate together over jobs well done, and we work together to improve ourselves, our working methods, and our company every day. 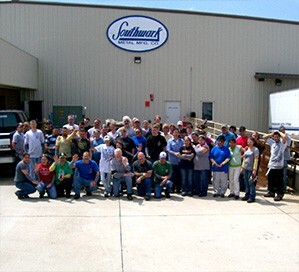 Southwark is dedicated to hiring and maintaining the best people to contribute to our overall success. Join us and become an important participant on the Southwark Metal team! Interested persons can download one of our applications below for submission to our Human Resources Department. Completed application forms can be sent to Corporate Headquarters’ Human Resources by fax at (215) 735-1312 or by email to hrsw@southwarkmetal.com. Applications are considered “active” and eligible for consideration for thirty (30) days. Southwark Metal Manufacturing Co. is an equal opportunity employer and will not discriminate against any employee or applicant on the basis of age, color, disability, gender, national origin, race, religion, sexual orientation, union affiliation (if any), veteran status, or any classification protected by federal, state, or local law.